XRP: We Will Persuade the Masses! Apple is the best at smart phones, but they know very well that marketing and getting the word out is a key factor. It's necessary to persuade buyers! Like Apple, Ripple has the best product as well; XRP. It is unrivaled in its use cases as a crypto-currency. I believe in XRP so strongly that I sometimes have to remind myself that new investors may prefer to learn it for themselves. I tend to be impatient and sometimes argumentative - I've studied the crypto industry from 2013 onward. I've seen the new ideas, the new crypto-coins, the recent ICO craze, and the ups and downs of the price movements. I'm used to these things, and through all of the excitement, I've never lost track of just how amazing XRP is, and how it is currently transforming banking. What about ignorant people that have just stumbled into crypto investing with Bitcoin? What about those retail investors who have heard rumors of massive returns, but are too frightened to risk even a small amount of their portfolio on something that they might consider too risky? Great advice, right? I know, it's never easy starting up a conversation with a stranger, or even a family member or friend in some cases, about topics that tend to be more technical and difficult to comprehend. But try it out. If we all make a point of having one conversation per day about XRP with somebody new, or maybe even a group at lunchtime, word will spread across the world faster than you would care to understand! We need to be able to talk to these new people, and address what their (and our) concerns might be. I can tell you honestly that I hesitate to suggest to many of my own friends and family that they get into crypto currency investing, because I know that securing your investment is one of the keys to being successful - in addition to the simple passage of time! Ripple knows about this concern, and they contracted with BitGo, another Silicon valley startup, to create an enterprise wallet application for IOS (Apple). This is a great development for potential XRP adoption. First and foremost, explain to your friend (or family member) that they should think of XRP like any other crypto-currency. At its root, it is a simple store of value, like Bitcoin, Ethereum, or any other crypto-currency. We have to start somewhere, right? Now hit them with the exciting stuff! XRPChat is a wonderful place for investors to get unvarnished opinions from others about Ripple and XRP, and the real benefits, comparisons to other cryptos, and market information that they may be craving. It's also a good forum to get advice on anything regarding fintech and the market in general. The mind-share at XRPChat is considerable, with over 5,000 active members. If they encounter some of the negative stereotypes that XRP has had to overcome, they will be more ready to challenge those portrayals if they've had a chance to review the way that company founders respond to them. One of those most influential members is David Schwartz, the Chief Cryptographer of Ripple. (His online avatar name is always JoelKatz). 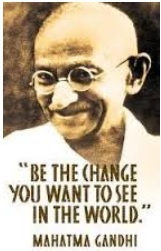 Mahatma Gandhi said it best - as XRP Adherents and Believers, we must "be the change we want to see in the world."